The Old Arcade Reading Post, located in Silverton, Colorado, was the last Bordello to be built on Blair Street. Cribs were in the back of the building, and up front were large pool tables and a gambling hall. When the current owner took over the building, a secret room was discovered beneath the floorboards. In this roughly carved out space, which was big enough for a ladder and perhaps three people, bottles of liquor were found from when prohibition was strong. Today The Old Arcade building still holds much of its original integrity. The current owner has sought to preserve the historic building and maintain the feel of the Old West. The Old Arcade Trading Company has been a family run business for nearly 30 years. 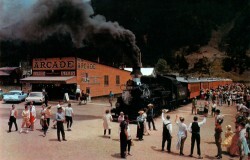 Three generations have worked in the Old Arcade Trading Company, greeting daily the Durango to Silverton Narrow Gauge Train (May 5th to October 27th) and providing fun and unique souvenirs for all. 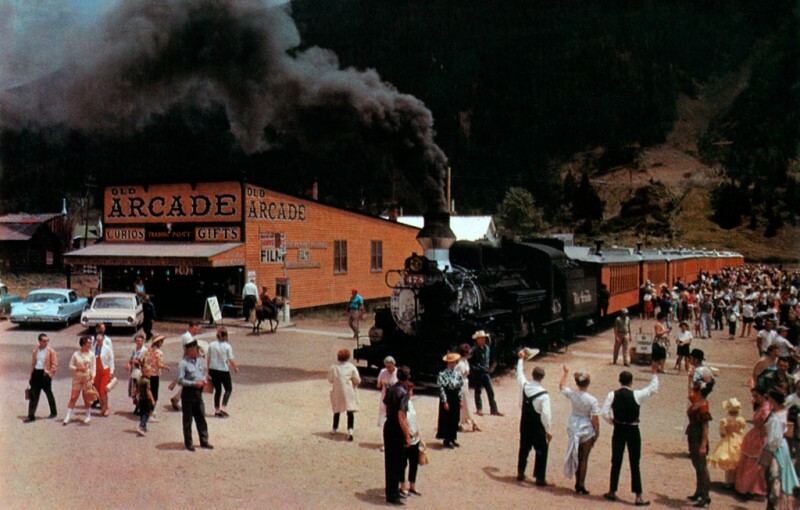 The Old Arcade Trading Company is one of the largest stores in Silverton, Colorado! The building holds a variety of unique souvenirs, from collectibles, postcards, cowboy hats, colorful adult and children's Colorado t-shirts and sweatshirts, toys, and of course everyone's favorite, fresh homemade fudge. Once you step foot inside you're sure to find something for everyone, and be sure to investigate the great sales that are always present throughout the summer. Each day the Old Arcade Trading Company has a mouth watering well-stocked fudge counter. The fudge is made on site, by our local fudge artisans! Some flavors you're sure to love are chocolate pecan and walnut, vanilla, peanut butter chocolate, mint, and other specialty flavors like the Mother Load or Cinders and Smoke! Then enjoy yourself lounging on the Old Arcade's boardwalk, eating bites of homemade fudge and watching the train roll into town. As you step onto Notorious Blair Street, look for the bright orange building directly where the train comes into town. Inside this Historic Bordello, you will find a great collection of Colorado souvenirs, friendly faces, and delicious homemade fudge. And be sure to ask for your free sample!